Combines high speed with superior retentate recovery for concentrating very dilute solutions. Sartorius™ Vivaspin™ 2 Centrifugal Concentrators: PES Membrane feature twin vertical membranes, small internal surface areas and thin-channel chambers. Available in a range of MWCO and packaging quantities. Vivaspin concentrators are disposable ultrafiltration devices for concentrating biological samples. 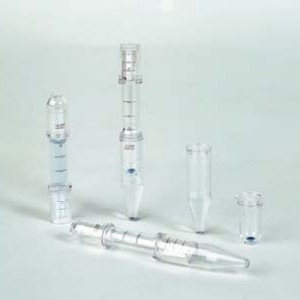 Vivaspin 2 is designed for use with samples from 500μl to 2mL in rotors that accept 15mL centrifuge tubes. The unique design provides high-speed concentrations for even particle-laden solutions and near-total concentrate recovery. Quantity 25/Pk. (Starter Pack) 5 Ea.